EghtesadOnline: German Chancellor Angela Merkel warned the U.K. that it must pay what it owes the European Union as part of Brexit talks, saying it’s misleading to view the costs as a divorce bill. Separately from any Brexit deals, the EU’s next budget talks will “surely be very difficult” because the 28-nation bloc is losing a net contributor, Merkel said. As Merkel runs for a fourth term in Germany’s Sept. 24 election on a platform of defending EU values, she joined French President Emmanuel Macron in criticizing Poland for a government push to encroach on the courts. While countries such as Poland and Hungary can always take grievances to the European Court of Justice, “we can’t make any false compromises,” Merkel said in response to questions from a German student in the podcast. After a series of government overhauls of Poland’s judiciary raised questions about the independence of courts, the EU’s biggest eastern economy may face EU sanctions over what the union calls an attack on the rule of law. Along with countries such as Hungary and the Czech Republic, Poland has also ignored EU policy and refused to take in refugees, citing security concerns. 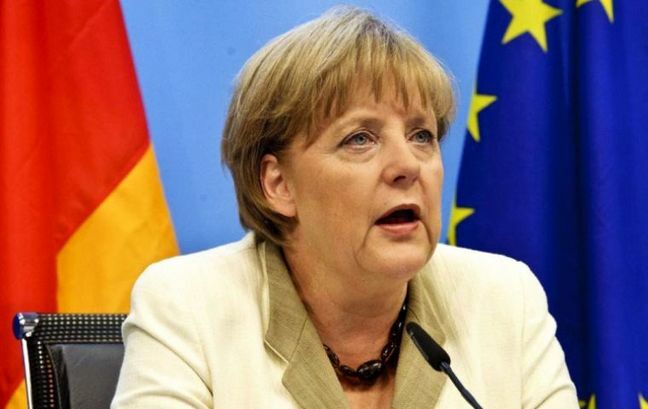 “We can’t pick and choose the areas in which Europe offers solidarity,” Merkel said. Separately, Spiegel magazine reported that European Commission President Jean-Claude Juncker is preparing a motion that could strip Poland of its voting rights in the European Council if the country doesn’t roll back the reforms of its judiciary system, a move that Merkel opposes and that Hungary may veto.